A hamlet which has been fighting for about a decade to be recognized as a forest village, Dilawar Nagar in Kachauna block in Hardoi District of Uttar Pradesh, has been razed to the ground for the third time. On the morning of March 18, at 9:00 am, a bulb mysteriously burst inside one of the straw houses and a spark is said to have caused the fire that engulfed the entire village. Every single house in that village is made of straw so the fire spread quickly. The accident took the lives of some cattle and one girl, who was injured, had to be hospitalised. Local authorities visited the site and helped put out the fire. They have also provided some ration and have promised financial help to all families. But the financial help will not be enough for the villagers to rebuild their homes and their lives. This is the third time this village has found itself destroyed due to fire. In 2005 and 2014 the Forest Department is said to have destroyed the village both times to chase them out of the area they inhabited. The view is strong, the land is not allotted to the village and the Forest Department dealt with the situation with violence, causing physical harm to the villagers and their houses. The village houses about 80 families, which is about 300-400 people, all of whom have been rendered homeless. The authorities have provided them with temporary shelters next to the destroyed village, but there is a lack of basic necessities and people are struggling to survive. Local social workers say, what they need right now, alongside financial and other aids, is moral support. They have been rendered homeless multiple times and it would be a show of solidarity if some people could visit the villagers and extend their support in any way they can. However, the way forward from here is to make sure something like this doesn’t happen with the villagers again. Their demand for pucca houses needs to be met, and until it is granted, there is a need extend solidarity and voices to them. The All-India Union of Forest Working People (AIUFWP) activists, meanwhile, have decided to reach the village soon in order to help them out, but they feel, there is a need for a larger agitation this time against such unfortunate accidents and deliberate injustices. Suspicion about what actually caused fire is still strong. The assertion to be recognized Dilawar Nagar as a forest village picked up in 2008, when people got organized under AIUFWP and started an organized struggle against forest officials. They have continued to carry on their struggle under the Forest Rights Act (FRA). 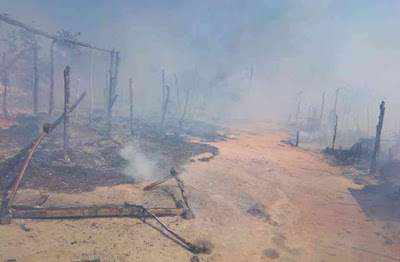 Evidence from the 2014 fire in the village suggests that there is a need for conclusive clues as to what caused the fire, but villagers strongly smell the role of Forest Department officials. The communities affected by the 2014 fire were till 1988 living in the Puranpur tehsil of District Pilibhit in Uttar Pradesh, till the Sharda river flood washed away their land and the people were rendered homeless for three years. In 1991 the families were resettled in Dilawar Nagar, Gram Panchayat, Simra Janipur, Tehsil Mohammadi, Lakhimpur Kheri. Following the 2014 fire, even though many cases were filed against officials, no charges were pressed. The process of claiming legal entitlements under FRA were disrupted by the Forest Department, which led many to suggest who actually was behind the fire. The matter was taken up by the National Human Rights Commission (NHRC), which stated that the processes at play in Dilawar Nagar were a violation of the right to life and shelter, both which are are constitutional provisions. Yet, only minimal rehabilitative measures were carried out. Only some families provided a paltry compensation of Rs 5,700. There was no investigation to ascertain the cause of the fire and the district officials have resisted all efforts to address people’s problems.